Light Up Your Bathroom Today! I think you'll agree that taking a shower is one of the most important things a normal individual such as you and me can do on a daily basis. Being that it's a daily activity, have you ever thought WHY it has to be boring and not, FUN? I asked myself this question when I was shopping for a shower head, and accidentally came across a led shower head. Seeing that you can actually light up your bathroom with a rainbow of colors, I decided to give one a try. The first experience was quite cool, it was like a dance part in my bathroom (minus the music). While it was a cheap one at the store, I wanted something better. That is why I set out to find the best led shower head I could find. During this search, I found about 7 in total which I found to worth looking into. To make things easier for you, I organized them in order from most recommended to least recommended. Regardless which number, they made it on this list because they stood out to me. 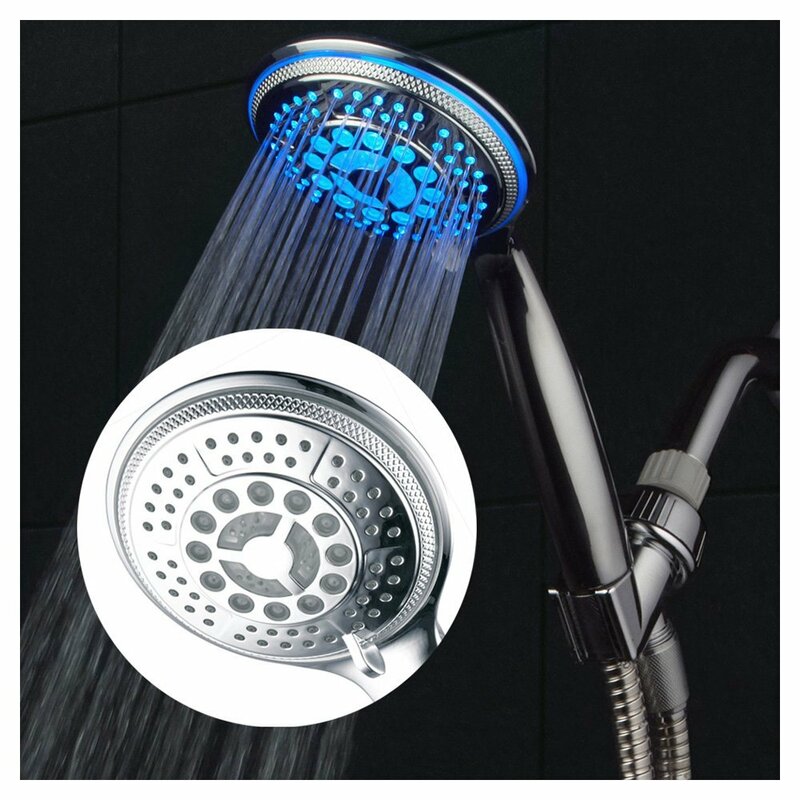 Below you'll see the top 5 summarized (if you want the straight to the point favorites) and then there's thorough led shower head reviews which I compiled with detailed pro's and con's for each. 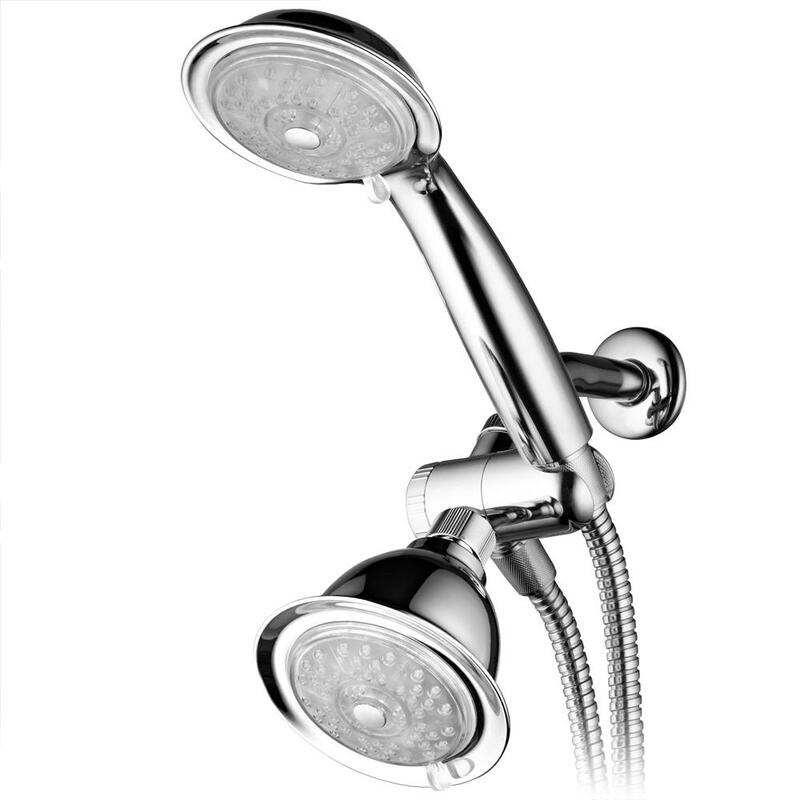 Before you get any further with reading my led shower head reviews, did you look at the chart shown above? In a nutshell, those are the most recommended ones from the list of 7 below. While you may be looking at them and wondering, okay but which one does I choose... I'll give you some pointers. There's a few different aspects you should be looking into when choosing a led light shower head. These things are for the most part the same as regular ones, with the exception of being powered by electricity to generate light. Some use batteries while others use a little generator which powers ON when water passes through it. The latter is the most recommended choice because you'll never have to replace batteries. Do you want a single flow of water or multiple settings? Some basic versions have no selectable flow and spray settings. Picking one that lets you go in many different directions with your spray patterns and water flow, will give you the customization you'll likely need at one point or another. The last thing you should consider is the price. Being the best sometimes comes at a cost, so KNOW if you are willing to spend the money for what you LIKE. The list below that I compiled, has many different shower heads which vary in price from cheap to moderately expensive. None are overpriced as I wouldn't want to buy them either. 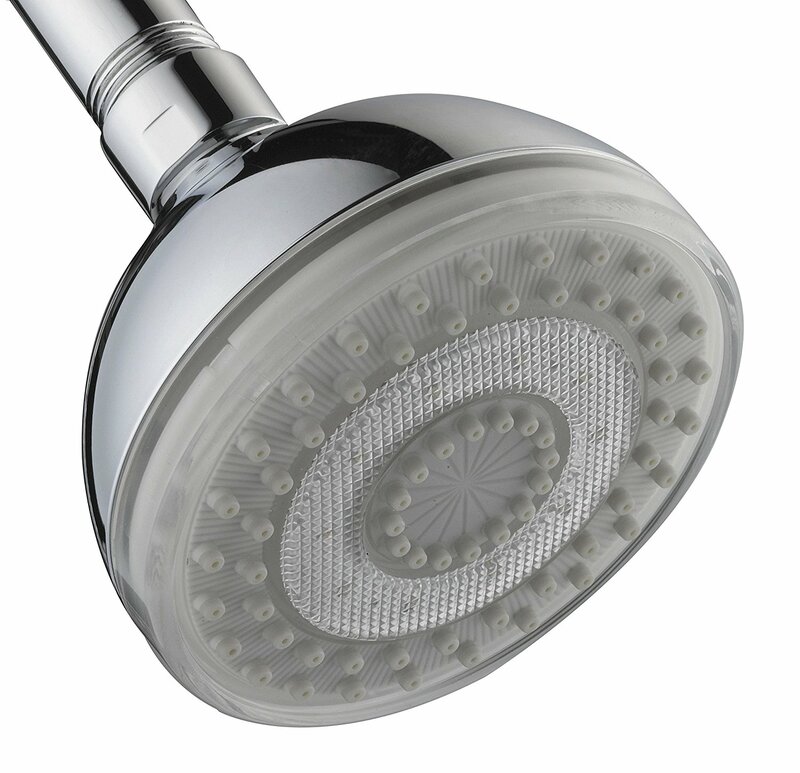 If you're wondering what is the best LED shower head, it's no other than DreamSpa M482. This shower head is here to show you that you can always combine beautiful and useful. Made completely of chrome, its shiny color will give you the feeling of happiness just when you look at it. At its price of $34.87, this product looks way more expensive. Of course, we are greeted by the fantastic LED light and you can change colors, too! This is especially fun when you are taking a shower with your kids or wash your pets. Feature-wise, we can pretty much say that this the most advanced shower head at the moment. It comes with a total of 5 different settings that include pulsating massage, hydro-mist, economy rain, water-saving pulse, and power rain. Your shower will become a breeze and enjoyment until you run out of hot water! But, thanks to its water-saving pulse, you'll still get a decent life out of your boiler. For those who are newbies, DreamSpa granted us a tool-free installation, so you'll get it running in just a couple of minutes. All in all, this is an outstanding quality for the price. A premium design that looks nice and has an amazing built quality. DreamSpa Model: 1482 comes with 5 settings that many of users will find satisfying. The LED light is awesome! It looks stunningly bright and you don't need batteries to power it up. It's also very affordable. For a price of $34.87, you can't get a better deal than this. Due to its motion limitations, it's best suited for fixed showers. We have DreamSpa and PowerSpa, which can get quite confusing. One is simple, though. Both of these manufacturers know their business. Luminex comes from PowerSpa and it's a great color changing shower head for your bathroom. When it comes to the design itself, Luminex looks dope! Its combination of both fixed and handheld portion are something that makes me smile. To make things better, PowerSpa included LED lights for both of these, making it an interesting buy. If you like a sheer power of water pressure, you'll be happy with its Hydro Supercharged Turbine that gives you that nice punch when you crank your water. Thanks to this technology and to the high water flow, your Luminex is unlikely to clog that easily. The showe rheads come at 4" of diameter and 4 settings for water flow. It's clear that PowerSpa loves number four and it's also pretty clear that Luminex is their magnum opus. Would you believe me that this product costs $39.98? Me neither! The combination of a fixed and handheld portion is always great to see. This feature distinguishes Luminex from the other products. Both of the shower heads are LED-backlit. With Hydro Supercharged Turbine technology, you'll feel the power of water pressure and stop clogging once and for all! Luminex comes with 4 shower settings. These are more than enough for keeping you satisfied. It's made of plastic, which is a shame, considering its price. The stainless steel would be a great option to consider here. Are you looking for a sub-$20 color-changing shower head? Well, Pission made sure that you can save your cash if you buy PSH-A3. PSH-A3 is a shower head that looks quite simple. The handle is relatively long and the shower head itself is narrow on the upper side and wide on the lower side. From this wide shower head, you'll see one of the most beautiful water jets ever! As soon as the water starts flowing, the LED light will illuminate your bathroom, breathing some new colors into your shower routine. Since we have 3 settings here, we can't say it's the most generous product on the list. However, we do have 7 different colors, making it great for your kids. Since we mentioned the handle, it's important to tell that this thing is handheld. Unfortunately, this one doesn't come with an additional, fixed shower head which is okay, given the price. If you ask me, you can't go wrong with Pission PSH-A3 and its funny price of 20 bucks. Pission PSH-A3 has an amazing build quality, especially for its cheap price. The LED illumination in this product is simply amazing! You get a total of 7 different colors which change according to your water temperature. When it comes to the installation, PSH-A3 offers a tool-free assembly, making it great for every bathroom. Finally, it's ULTRA cheap. You can't get a better deal at this price range. The design works well, but it's fairly simplistic and uninspired. With a total of 3 settings, PSH-A3 isn't exactly the most generous showerhead. It doesn't come with a hose. You have to buy it separately. With a beautiful chrome face, there's a 3-zone dial that lets you select a few different spray settings. The face has a slightly raise surface which on the outer edges, has led lights which illuminate a few different colors every few seconds. What I find neat is the simple design from inside and out, here's what I mean. When you want to use it, you can easily screw it onto the main shower pipe, select your spray settings and start using. I mentioned previously what you should look for in a shower head is NO batteries, well this one has none. When water runs through, it automatically generates a small level of electricity which is enough to power these led lights. The moment you turn off your shower, the lights do as well. Also the price is less than 30 dollars, its something that is hard to beat! You won't ever need batteries, worry-free led lights without ever having to turn anything off (aside from water). Great price point, you can get one of these for less than 30 dollars. Multiple spray settings, there's more than one setting which let you determine the level of body coverage. The beautiful chrome outer body would match most things in your bathroom. 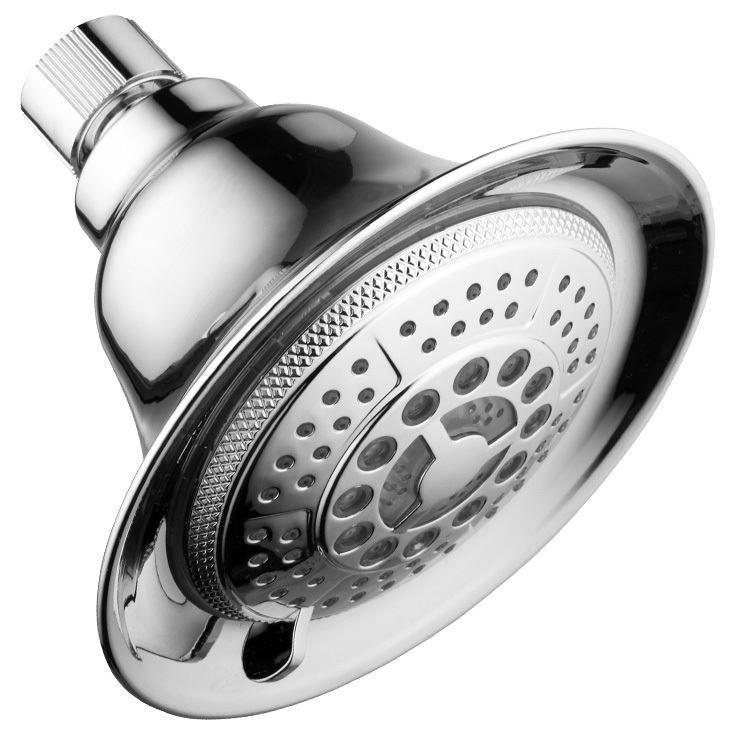 As long as your homes water pressure is good, this shower head will be a perfect match for your bathroom. Light can be a bit dim when not 100% dark. 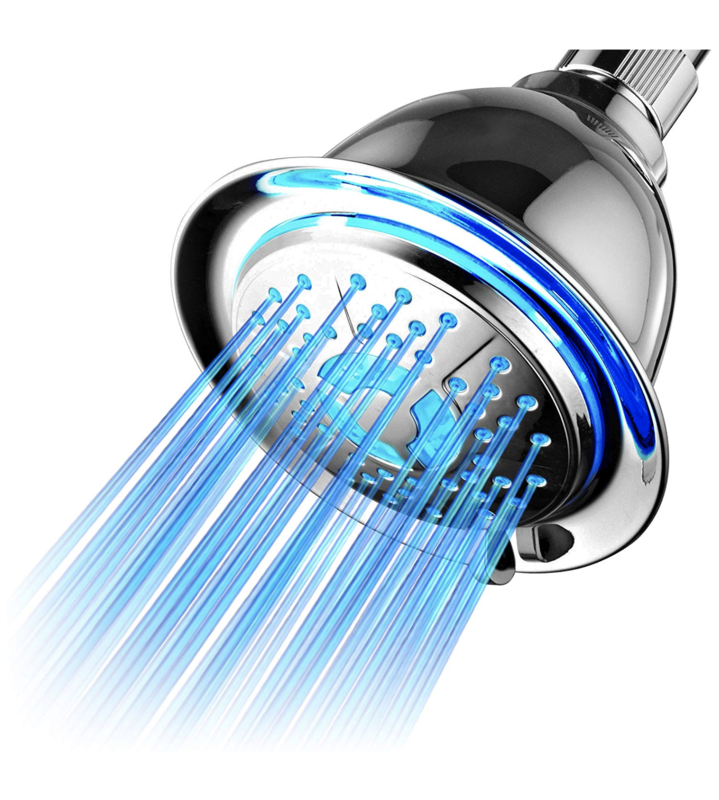 CNASA-US LED Hand Shower Head comes at a ridiculous price of $12.99. Given the price, you wouldn't think it's a low-quality product that's prone to break. 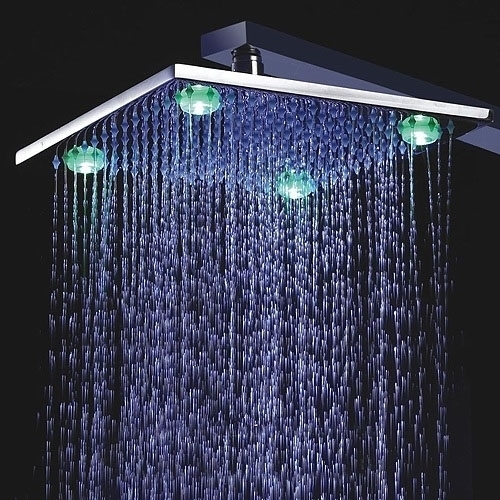 Before you think about that, let me tell you that this is one awesome LED light shower head. CNASA is made of carbon that gives it a lightweight feeling and thickened abs materials for added sturdiness. This shower head is indeed durable and sturdy, just the way I like it. Moving on to features, we have a LED light that can pride itself on having 7 amazing variants. The shower head itself is made in the way that we have a lot of dense holes that make the water jet eye-pleasing and strong. This is also a great feature if you want to save some water and forget about mind-bogglingly expensive water bills with Fywonder-US. Finally, we have a built-in filtration that will make your water clear and bacteria-free. Fywonder-US looks stunningly. Its design is one of the best, especially at its funny price. Aside from great visuals, it's made of carbon and thickened abs materials. They will give you enough sturdiness and durability to work with. At this price, it's pretty awesome to have 7 different LED colors. The product comes with tiny dense holes, designed to save your water and save some cash on your water bill. Fywonder-US can be completely disassembled in order to get it clean. It's affordable and you can get it for $12.99. It's a steal deal. A shower head itself is pretty small. 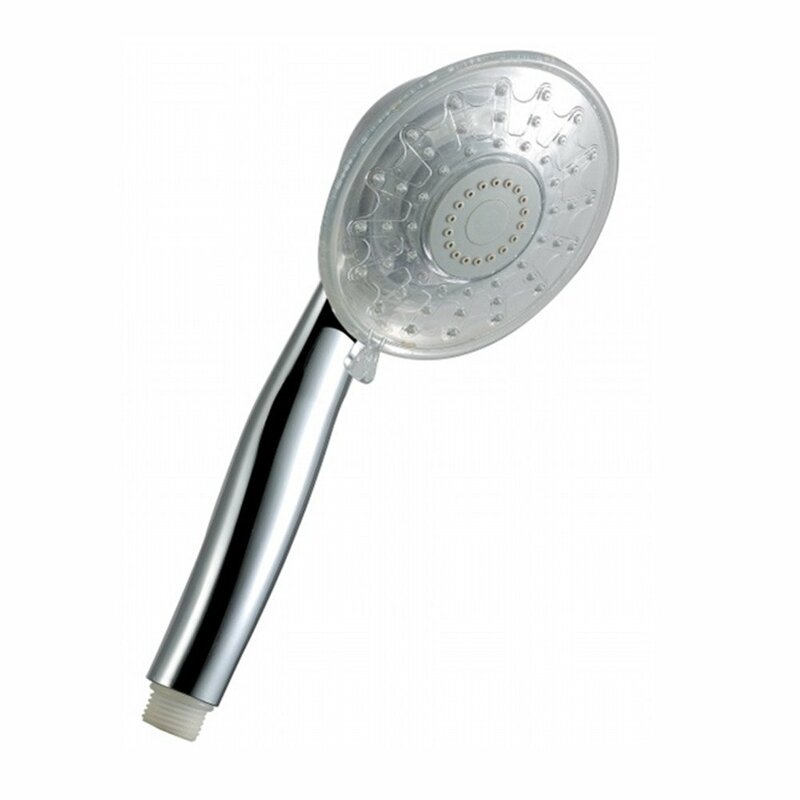 DreamSpa has proved to be a worthy manufacturer in a world of fantastic shower heads. On the first spot, we had Model: 1482 and here, we have an amazing Model: 1481. The interesting thing is that they look quite... well, similar. The material is again, chrome, and the build quality is second to none. Once again, we have a total of five shower settings that will please most of the buyers. You can enjoy a pleasant breeze with an economy rain mode or simply blast it all the way; it's your choice! Another great thing here is that the LED lights change according to the water temperature. No more abrupt and pointless changes that can be really annoying. Here, you'll get a color that perfectly fits the water temperature and you'll like that steamy red color coming from your shower head. When it comes to the functionality, we aren't limited by any means and dimensions. 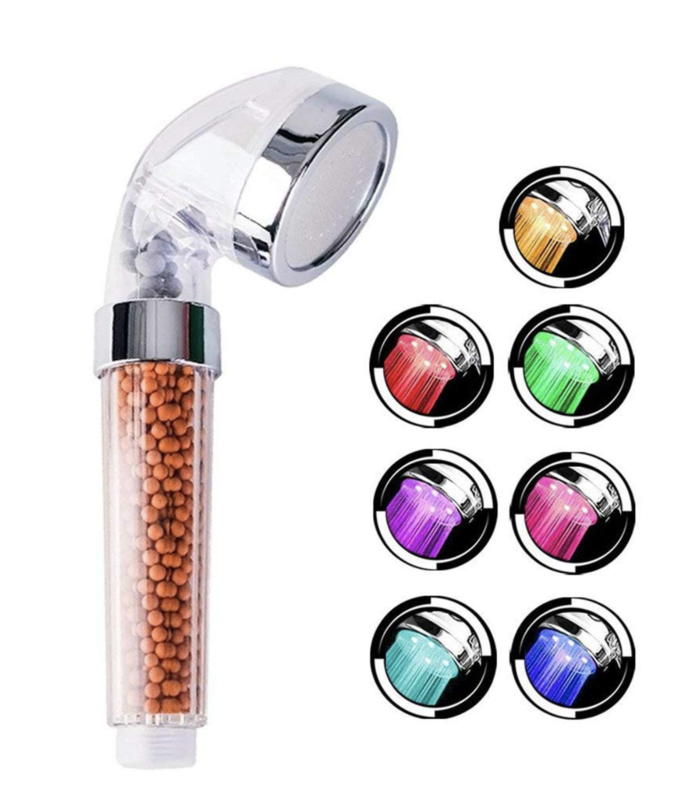 This is a fully-handheld shower head that you can connect to your hose and start your adventure. Although we have a tool-free assembly, I'm still exasperated by the lack of hose. Made of chrome, DreamSpa Model: 1481 provides enough sturdiness and build quality for its price. With a total of 5 different shower settings, this wand is here to give you a shower of your life. Although it's a portable wand, it can be mounted and used as an overhead one. This versatility perfectly justifies its price of $33.98. LED color automatically changes according to the water temperature. A tools-free installation grants simplicity and quick assembly. The design itself is uninspired. It's reminiscent of DreamSpa Model:1482 so it's easy to confuse one with another. For this price, it's a shame that a hose isn't included. Modona 7-Color LED Shower head is here to get some light into your boring bathroom. No offense, but LED light shower heads are a welcome addition to every bathroom. Now, Madona comes with some cool features and unfortunately, with some odd limitations. For example, we have a SINGLE mode here. You can't use any type of settings aside from the ordinary spray which you can get with any normal shower head. This is a pity since Modona costs around twenty bucks. For twenty bucks, I'm happy that the LED light itself gives enough brightness. Depending on the size of your bathroom, you can pretty much enlighten the whole space! Speaking of light, the shower head changes color once in 5 seconds, making it a less eye-straining option. 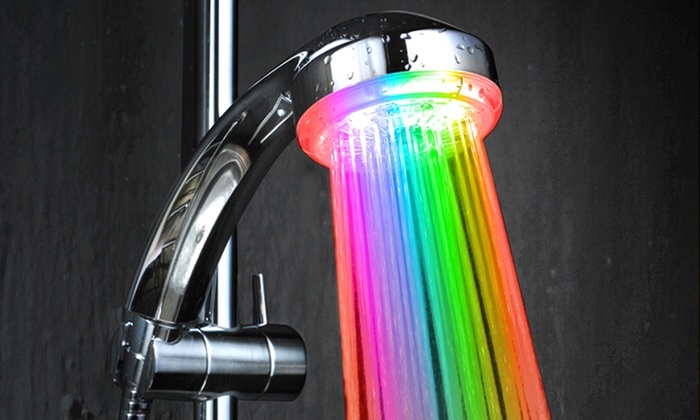 With its 7 colors, it's unlikely that you'll ever get bored with this shower head. Oh... I almost forgot to mention the angle-adjustable shower head. That's a pretty neat feature. Modona 7-Color LED Shower head is made of ABS and Brass, making it a durable and sturdy companion for your bathroom. As its name says, we have 7 colors of LED light. This is enough to make your shower experience more colorful and cheerful than ever. The LED colors change every 5 seconds. It's a nice addition that will make Modona more interesting. You don't need any special tools for installation. Modona can utilize only one shower setting. For a price of twenty bucks, we expected a bit more from this shower head. Going through my entire list, I hope you found this guide I wrote useful. As you all of the led shower heads I mentioned, you may of noticed that none are out of reach financially. Each one was made for people like you and me to easily install and start enjoying immediately. Before you leave, consider getting a lighted shower head for at least one of your bathrooms. It would be a pleasant surprise for not just your house guests but also if you have any children. Odds are you'll have a hard time getting them out of the shower because of the funky lights. If you enjoyed what you read, consider sharing it with your friends or family on any social media sources below!